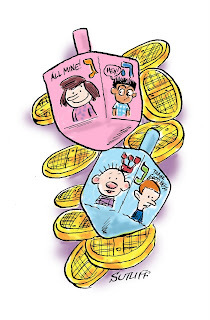 Joe Sutliff's special Hanukah drawing of the Otterloop children and friend scan now be purchased at Zazzle, as of just a few minutes ago. Joe says, "I was baking dreidles for the Sunday school when I had this idea, so I just drew it." Barbara Dale's TCDS stamp #2 went out on my Christmas cards today. From: Joe Sutliff, "I was baking dreidles for the Sunday school when I had this idea, so I just drew it. I'll send the original to the auction as soon as I get a chance." 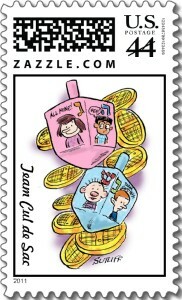 Joe's cartoon will be Team Cul de Sac #4 so we can get the influential Jewish cartoon stamp collector crowd's money before Hanukah. 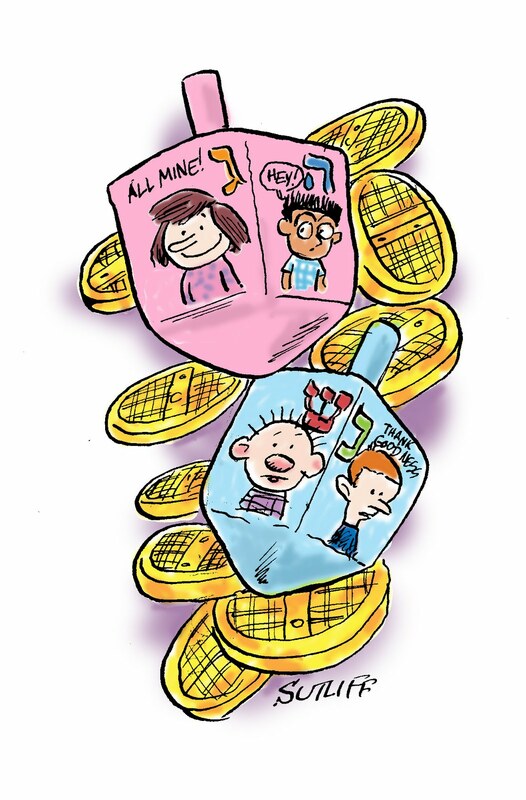 Barbara Dale's stamp has been revised to lighten it up so you can see Alice better, and David Hagen volunteered his artwork for stamp #3. Collect them all! It's for charity! That's Comic Strip of the Day, and it was about a week ago.